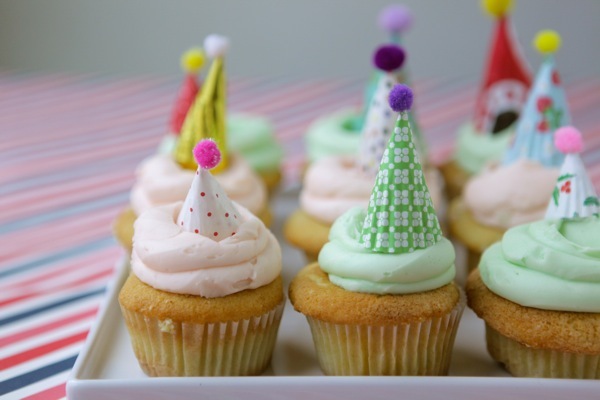 Party Hat Cupcakes from Oh Happy Day! It is sort of my dream to have a birthday party thrown by Jordan Ferney and the other fabulous bloggers behind Oh Happy Day! They are birthday party experts in my opinion and I love every idea that they come up with! If you need a fun party theme, check out all of the cute birthday party hat ideas, including these party hat cupcakes, they have recently shared. And if you need ideas for garlands, Jordan is your girl! You can check out these cute mini party hat cupcakes and the rest of the great party ideas over at Oh Happy Day!